My $56, 20-microns-thick roll of silver Boardwalk 7126 Heavy-Duty Aluminum Foil had been lurking for months under my reading desk. I had done all the indoor foils I could think of, my most successful being pieces I had wedged into gaps between furniture and walls, or into corners, or draped, for example, from ceiling to the floor. 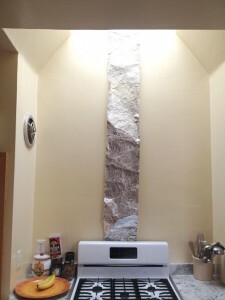 I’m particularly fond of the zip that cascades from the skylight down the wall behind the kitchen stove. Beyond the domestic, I had tried to interest some gallery owners I knew into letting me do a pop-up fill-up of their space with a faux labyrinth. No takers. I had done a pop-up “scholar’s rock” inside the Turrell sky room in the de Young’s sculpture garden. (When I was taking a break after a while, it was removed.) 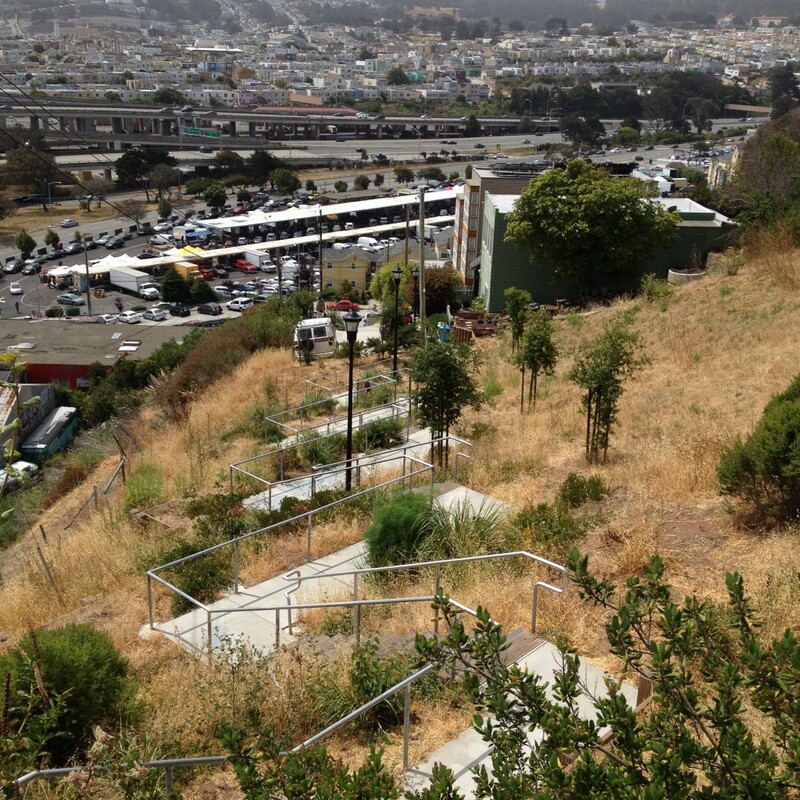 And I had tried “drawing” a 50-foot “line,” starting at one of the home plates in Rossi Park…but it quickly blew away; on YouTube, it looks like a tumble weed fleeing the camera. It felt like the right moment to launch my big roll down the steepest street in San Francisco. 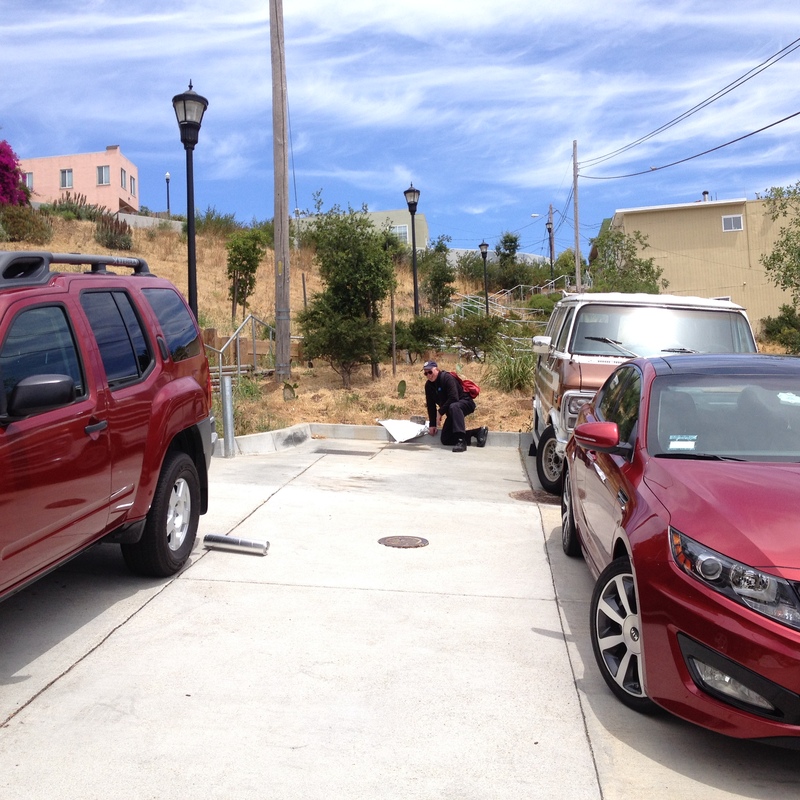 It was David LaBua, a leader in the sustainable urban mobility movement, author of Finding the Sweet Spot: The Insider’s Guide to Parking in San Francisco, and founder of VoicePark, the world’s first voice-guided mobile parking app, who revealed, in August last year, in the blog of the city magazine 7x7SF, the steepest street in the city: Bradford above Tompkins (41% grade). 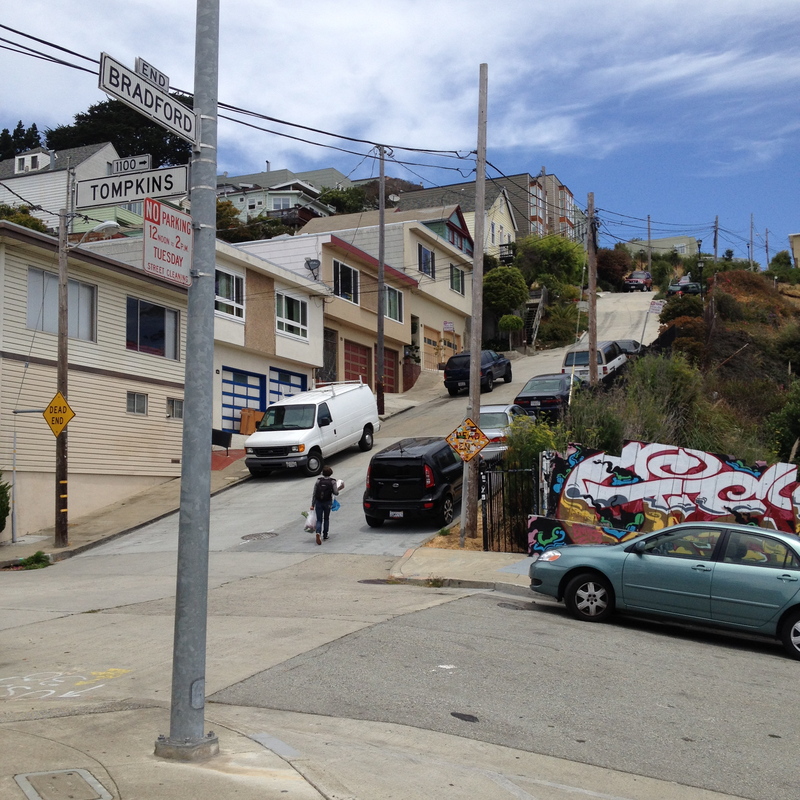 Google Directions indicated that the 24 Castro, which I could connect to with the 38 Geary, which is just around the corner from my house, would take me over to Bernal Heights, within striking distance of the precipice. 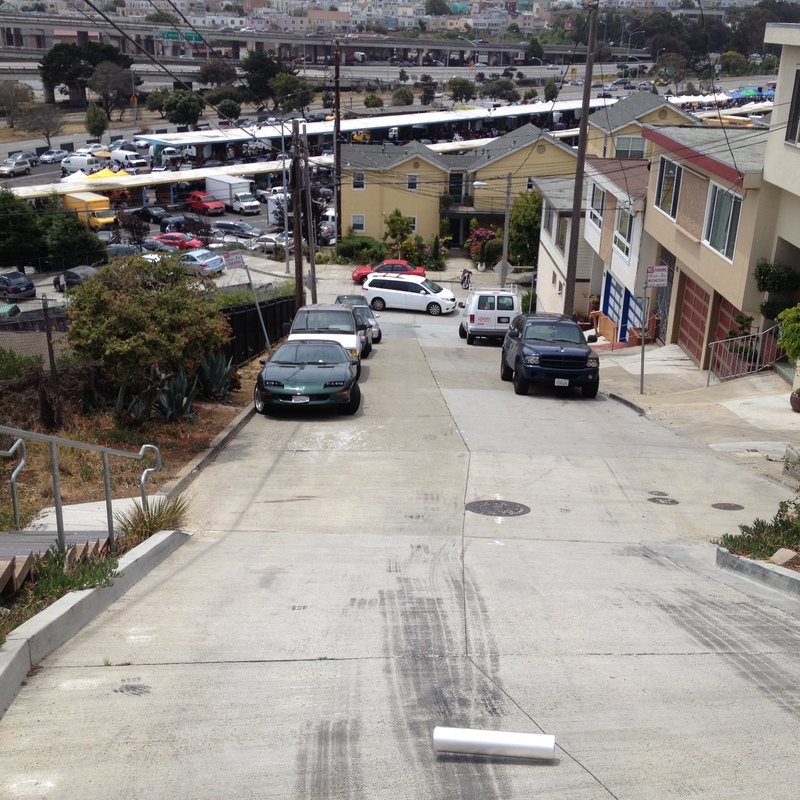 Unfortunately, hustling—I hesitate to say running, since I’m so slow—to catch a 38L, my foil fell out of my back pack. This was later to have disastrous consequences, although I scooped up the 17-pound cylinder and made it on board. I got off on the main drag of Bernal Heights, Courtland St., figuring to lay in some provisions at the excellent Sandbox Bakery.I asked the server about the scones, but she liked a kind that didn’t thrill me, so I ordered her favorite, a banana-nut muffin. I am not a muffin person, but I like to be polite and it seems stupid to ask for a recommendation if you dismiss it out of hand. And the hot chocolate wasn’t so hot. 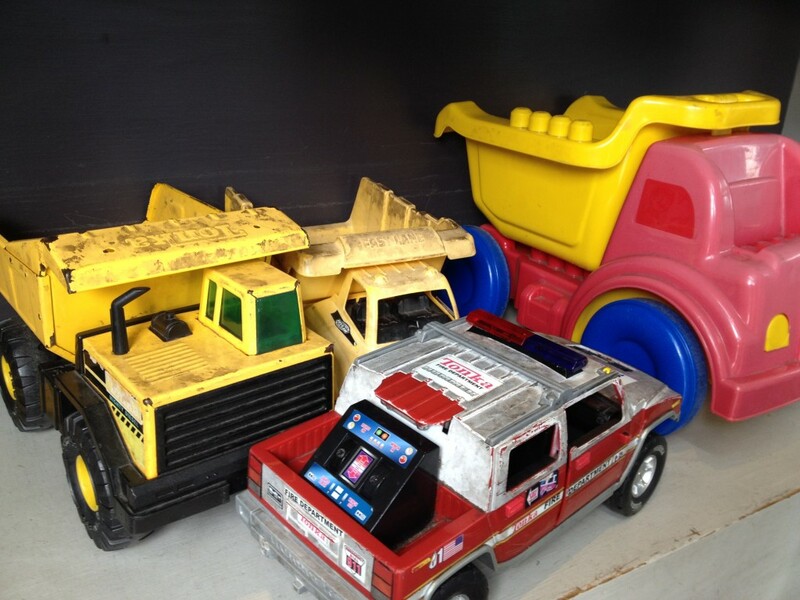 But, on a lower shelf to the side of the baked goods, I did like the earthmoving equipment the kids get to play with. 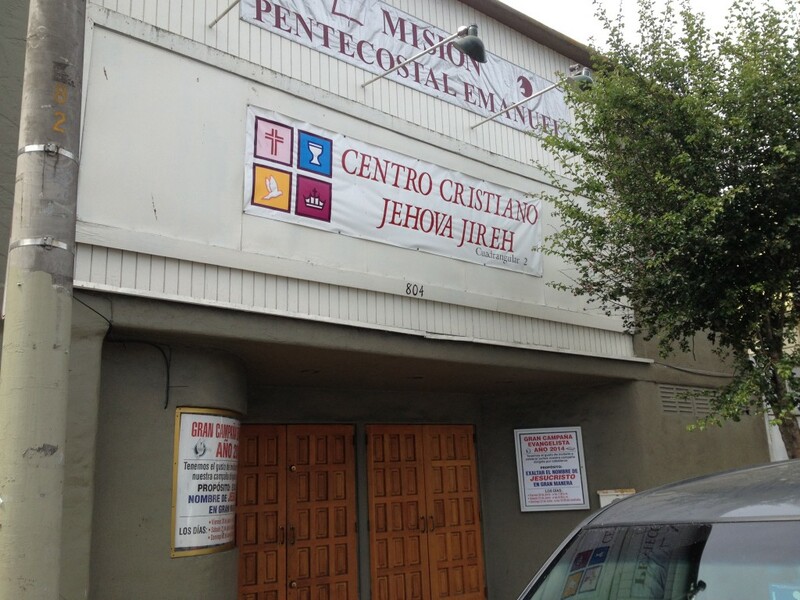 And, across the street, I was glad to see that the Grand Camp Meeting of the Mision Pentecostal Emanuel was taking place this weekend, with the proposal “to exalt the name of Jesus Christ” en gran manera. 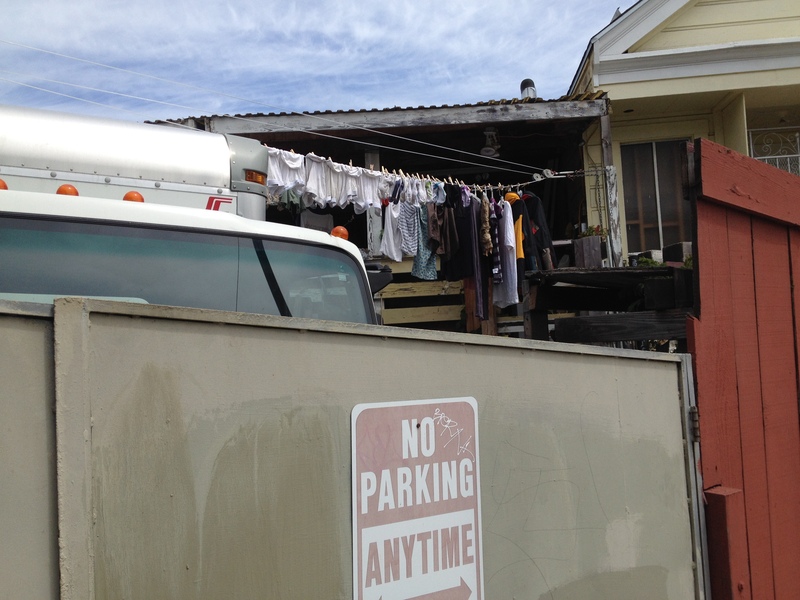 Meanwhile, down the street, it was laundry day—you have to admire the underwears and the socks and the colored shirts all hung out in the right order right down the line. Courtland then began to slope down toward Bayshore and to Lowe’s and Floorcraft and The Old Clam House Since 1861, and I was afraid there couldn’t possibly be enough elevation to let Bradford drop off sharply, but then I turned right onto Putnam, because the map didn’t indicate a through street to Bradford, and Putnam rose up to the south, which reassured me. 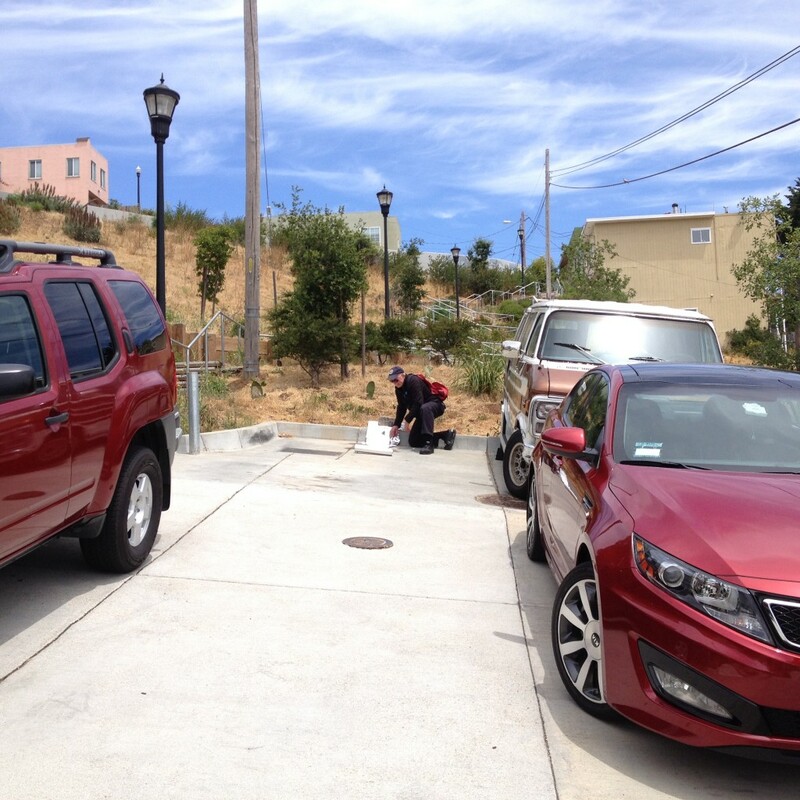 My foil, though, had suffered terribly en route—it slipped out of my backpack again outside the Sandbox Bakery. The ends were compressed and loaded with dings, which meant I couldn’t get a clean sheet to roll out across the entire roll. Slivers kept sticking. Sections were jammed solid. This deterioration might be acceptable for some pieces, but not for a spool-out down a steep street. Fortunately, I had 15 minutes to futz with it. Just as I figured I’d gotten as clean a sheet as I was ever going to get—and it was still noon only if you were giving yourself a little avant-garde slack—an Aussie named Scott, coming back from the Farmers’ Market with his sheila, was kind enough to iPhoto me. 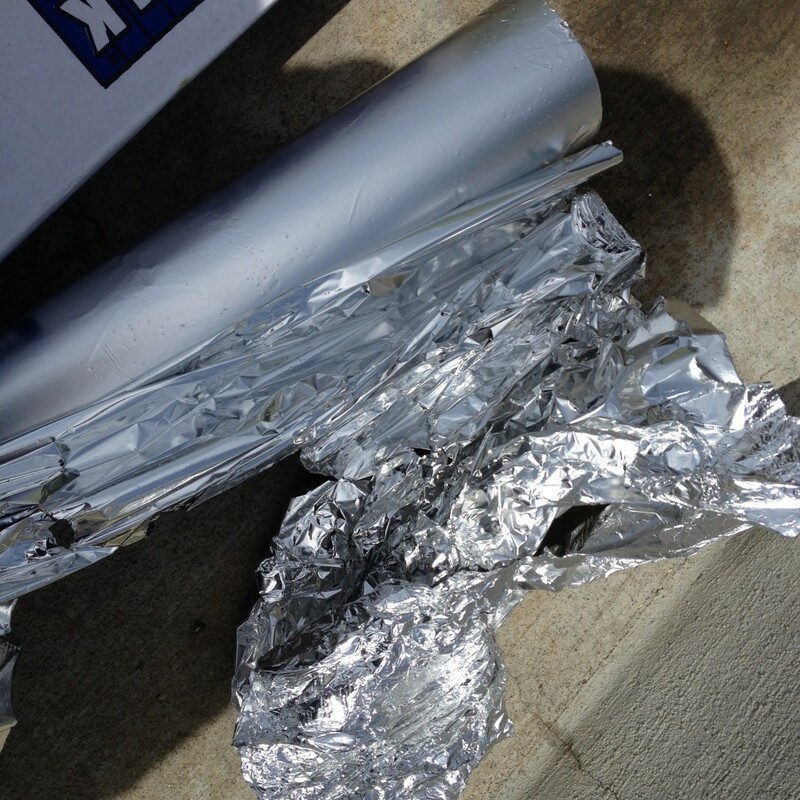 The sheet of foil quickly snapped, and the cylinder rolled by itself precipitously toward a tire. 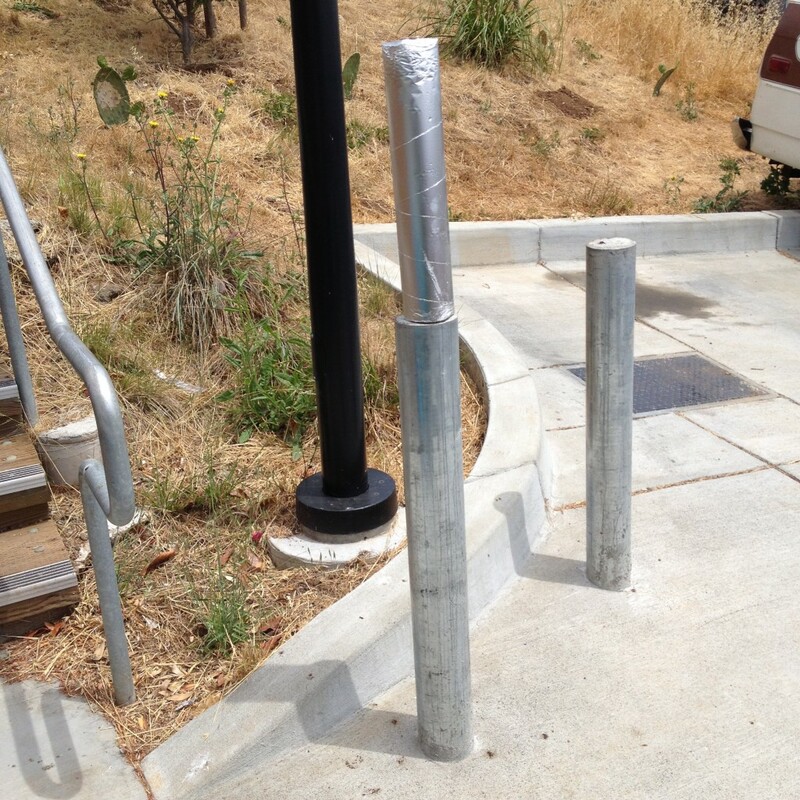 I tried a Plan B, which was to mount the cylinder as a Brancusian column. Then, faute de mieux, I launched the cylinder qua cylinder, and it careened down the slope and out of sight. In retrospect, Bradford is not very steep, it would seem, except for a brief passage. 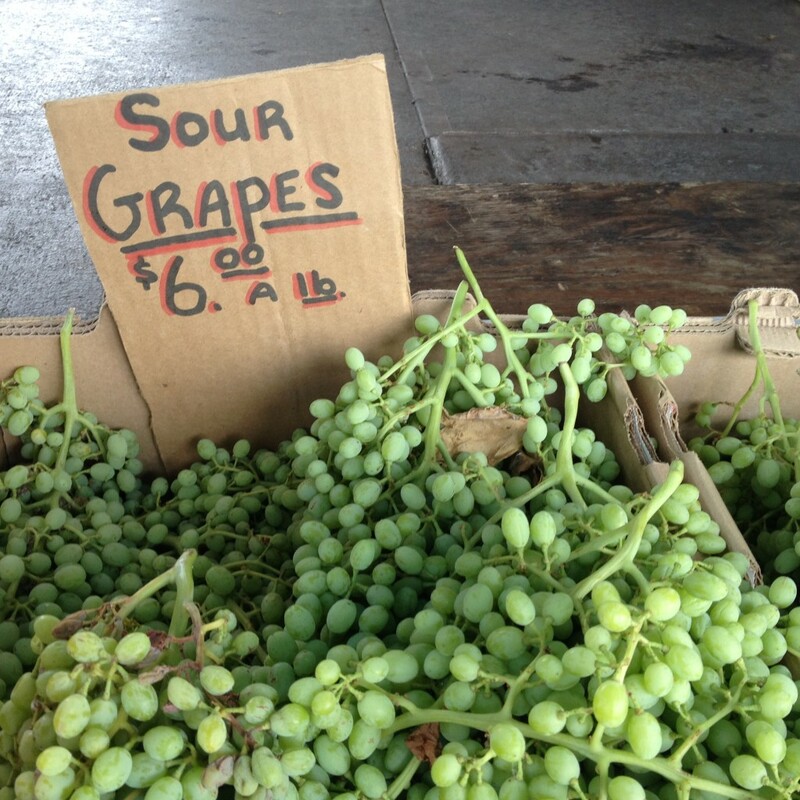 In the Farmers’ Market, I found everything I needed: basil, blood oranges, blackberries, and sour grapes.